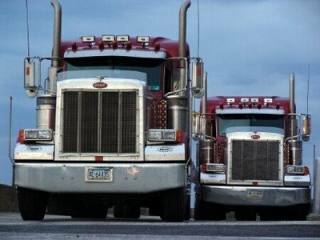 Last week was National Truck Driver Appreciation Week. It certainly was nice to feel appreciated for a week. While nothing changed much, it was the little things I enjoyed. For example, all of the digital signs in the state of Missouri read "Missouri Thanks our Safe Truckers!" and "Thank you for Staying Safe Truck Drivers!" I also got a 50% off coupon at a restaurant, and talked an employee into giving me a free shower credit at the Flying J as I don't have a Flying J card. But why do we deserve a week of appreciation? What makes us so darn special? A lot of people have tough jobs that I'd never want to do. I wouldn't want to be a sales rep, for example. I know, because I've already been one! So why don't they deserve a week of appreciation? I'll go into some reasons why I believe truck drivers deserve just one week of appreciation (God knows we don't get any appreciation any other time!). For one, truck drivers consistently make the "Most Dangerous Jobs in America" list. Truck driving, for example, is even more dangerous than firefighting or law enforcement (of which most law enforcement deaths occurfrom traffic accidents).Most accidentsthat truckers are involved in isn't their fault either (to the tune of just over 70%).Truck driving has never been safer than it is today, and we've been falling further and further down the list of the most dangerous jobs. According to the most recent CNN survey, truck driving is currently the 9th most dangerous job in America. This is down a couple spots from the previous survey, but the fact remains that truck drivers put themselves in harms way every single day. Most people don't realize this. We won't even get into the dangers HazMat loads pose. Truck drivers spend weeks, and sometimes months, away from their friends andloved ones. While there are many local jobs available in truck driving, most of us long haul drivers are away from home for weeks at a time. Those who own their own trucks are usually gone at least a couple months at a time. This is a huge sacrifice, not only for the driver, but for his / her friends and family as well. After being away from home for weeks or months at a time, the driver is rewarded with usually less than one week back home, before the cycle starts all over again. Truck drivers live a life of solitude and mobility. Truckers don't get to go watch theirkids play a little league game. They can't curl up next to their husbands or wives at night. Theydon't get to take hot showers in the privacy oftheir own home.They live out of public restrooms and shower facilities.They don't get home cooked meals. They sleep where they work, and work where they sleep (which is an area smaller than a jail cell). They often times go months without seeing any familiar faces. All of this comes with few complaints from a seasoned driver. Truck drivers work when they are needed and sleep when they can. There is no such thing as a "weekend" and no such thing as "bedtime." Truck drivers must follow the strict guidelines set forth by the government and therefor, drive when the hours are available. This means driving at any time of any day and sleeping is just a secondary thought. And why do truck drivers do the job? Because they have a passion about what they do. Because without trucks, America stops. Truck driving is a public service, just like any other. Could you imagine what would happen if no trucks moved in this country for just a single week? Complete chaos would ensue. No food, no medicine, no building materials....nothing. Despite all of the sacrifices truck drivers make, the vast majority of them are proud of what they do and take their job very seriously. Trucks keep America rolling. Truckers endure the vast sacrifices they make in their life. While many truck drivers, including myself,enjoy the job, it doesn't come withoutgreat sacrifice. We perform an valuable service for our great country and we are proud of that fact, even if we are often overlooked. For 51 weeks out of the year, it is a very thankless service we perform. The list of sacrifices that drivers make can go on and on for days. This post barely scratches the surface, and even all of my past blogs combined barely touches the subject.Most of the sacrifices can't be explained in words, they simply have to be experienced to truly be understood. But truck driving is far different from any other job in this country. I'm not saying other professions don't deserve recognition, but if an industry is to be recognized, I think trucking is just as good as any. On the same token, how many people in this country even realized last week was Truck Driver Appreciation Week? I rest my case. So, from one trucker to all the other truckers out there...Thank you!